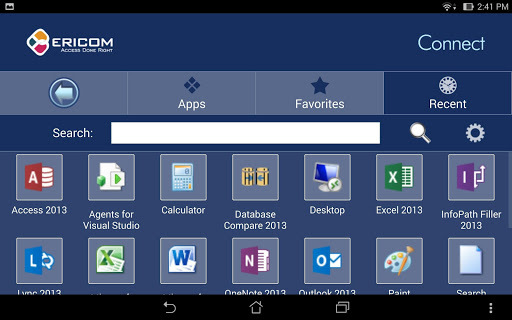 Ericom Connect Mobile client provides quick, easy and secure mobile access to centrally published and managed Windows desktops and applications hosted on Terminal Services, RDS, virtual desktops, and physical PCs. 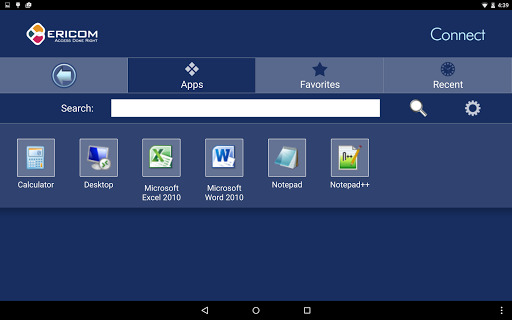 Access your office PC and Windows apps (e.g., Word, Excel, Acrobat and other business applications) from Android 4.4 & higher devices, e.g., Samsung Galaxy S4, Google Nexus 10 & Kindle Fire HDX. Ericom Connect mobile client requires Ericom Connect v7.0 or newer installed: http://www.ericom.com/connect. 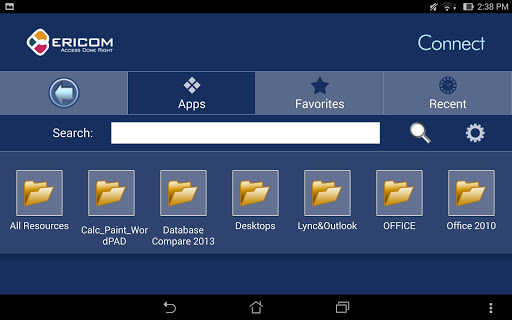 For ubiquitous clientless access, Ericom Connect also provides an HTML5, browser-based remote desktop RDP client called Ericom AccessNow. – Unique patent protected technology provides unparalleled usability and productivity by automatically resizing all Windows objects to optimal size. – Enjoy highly accurate screen control, intuitive up-down scrolling and the only mobile RDP client that supports both touchpad and floating pointers. 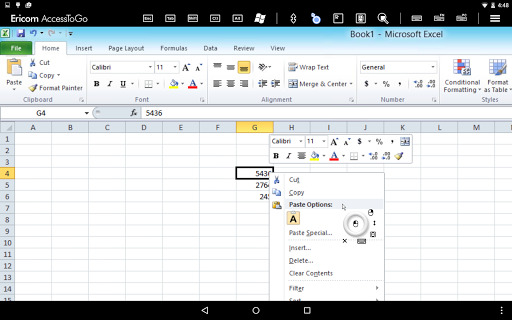 – Unique function bar for tablets that displays popular keys (Esc, Tab, Ctrl, Alt, and Windows) and other productivity functions. – Superior user experience –Blaze-powered RDP acceleration works up to 10 times faster than regular RDP clients. – Requires Ericom Connect Server v7.0 or newer installed: http://www.ericom.com/connect-enterprise.asp. 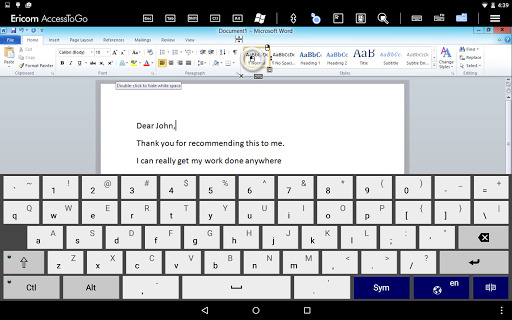 – Function bar for tablets displays frequently used keys (Esc, Tab, Ctrl, Alt, Windows) & functions – Exclusive! 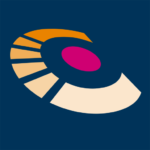 – Enhances display performance of maps, photos, streaming video, radiology images, 3D images, Adobe Flash and PDFs.